I thought I'd continue this thread here, because desktop setups are just interesting! Users have been using www.postimage.org lately which does a nice job and is Multi-lingual as well. Upload your image to the site and grab the Thumbnail for Forums (1) code. Please use the Report button to let moderators know of images that are too large. Thank you! 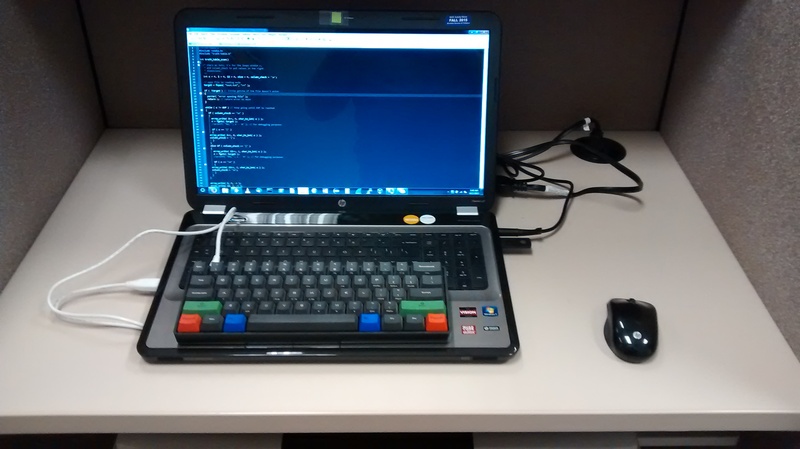 I think the idea is to take a photo of your physical desk, not your desktop from your pc. No, I won't. You'll fully criticize it (with all reason). Whenever i get my good desk and my ergonomic setup back, then I'll post it. ^ Same here. I'm currently using my new roommate's former roommate's entertainment system armoire as a desk. (I really don't like having to lean forward to type with my knees pressed against the front of the thing. ) This will be corrected in due time though. You have a lot of... well, everything... going on there! What a mix, manjaro, mac and #! logos together on the same machine. LOL. how many arms do you have? I lost count of peripherals.. The setup has 'sprouted' over recent years. There is also a hardkernel XU4 dev board in the pic. heh, i like the lockable metal cabinet. very old-school. I'll have to post my actual desk at some point. and my laptop is a DOSBook Pro after all, so... that could've given something away. Not much has changed since last time, more clutter, more machines. I didn't clean up for the pics, this is the way it is. Extra credit if you figure out what movie is streaming. My girlfriend's plants are battling with my equipment for growth space. I'll have to cheer for the plants, especially the cactus thing in the green pot on the window sill. Yamaha NS10s and a reel-to-reel? Thx, there HS80ms and and a TEAC A-2300SX reel to reel. It's a desert rose, and lots of bromeliads here in Florida. That's just the one wall... she's got a greenhouse in here! Close. Hamburger Hill is newer than the movie in question. P.S Is this getting too off topic? 1987 almost 30 years ago is not that newer. Sorry i have no idea about the movie, but i like your lab. I'll guess Platoon, but I'm not sure.